Isn’t this the cutest fly you have ever seen? This handprint fly craft was created by the Free Kids Craft team and Betty was kind enough to let me republish it here to share with all of you. Kids will get a kick out of making this fly craft with handprint wings, complete with veins 🙂 Fun Fact: Flies have two pairs of wings which are referred to as the forewings and hindwings. *This post contains affiliate links. Read more about these full disclosure policy. Printable of the fly’s body found below or make one from construction paper. Peel the backing off the laminating sheet or contact paper. Place it with the sticky side up. Create the lines in the fly’s wings by squiggling the yarn over the contact paper and pressing it in place. Take another laminating sheet or piece contact paper and peel the backing off. Lay this one with the sticky side down over the first sheet, so the string is in between the two pieces. Fold the entire sheet in half, then have the child trace around their hand. Cut around the outline making sure to cut through both layers. You will end up with two hands that create the wings. Print fly’s body found below or create one from construction paper and jumbo googly eyes. Glue the handprints on top of the fly’s body. Make the legs by cutting a pipe cleaner into 6 pieces. Adhere them to the fly’s body. Finish by bending the ends of the pipe cleaner legs. 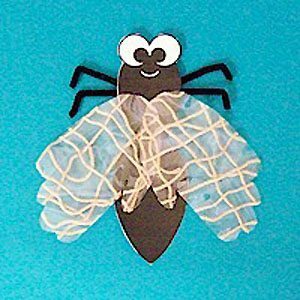 *This fly craft with handprint wings was republished courtesy of Free Kids Crafts. Published 1/16/13, Updated 8/19/17.Click to see more bugs and insects made with handprint and footprints!